But please, legislators and regulators, when it’s your local craft brewers waiting in front of the moat, asking for you to raise limits on capacity or to allow tasting rooms on-premise, to allow self-distribution or to just freaking sell their own beer to the people that come to their brewery, you should consider dropping that drawbridge and listening to what they have to say. And the reason is simple: It will boost the local economy, generate tax revenue and create jobs — local manufacturing jobs. I thought politicians loved stuff like that. But please don’t take my blah blahing for it. Let’s look at Minnesota. Five years ago, Minnesota lawmakers passed a bill that allowed craft brewers to open taprooms. In that time, according to this article from the Minneapolis Business Journal, craft brewers (about 45 in the Minneapolis-St. Paul area) have added a total of 481,000 sqaure feet to their operations. The combined footprint is now 480,562 square feet, equal to about a third of downtown Minneapolis’ new U.S. Bank Stadium (1.5 million square feet) or the 1.4 million-square-foot IDS Center, Minnesota’s tallest building. Fourteen more microbrewery and taprooms are planned in the metro, half of which will be in Minneapolis or St. Paul, and half in the suburbs. CBRE projects total occupancy will reach 551,220 square feet this year. For the most part, the pro-craft beer message seems to be resonating. In 2013, Ohio (CBB’s home) lowered the licensing fee for brewers producing under 31 million gallons per year in the state from $3,906 to an even $1,000 and allowed them to sell product to retail permit holders. There have been all sorts of crazy awesome local craft brewers popping up in the ensuing three years. Our fine state also just raised its ABV limitations, which is maybe not a huge deal, but it did make the mad scientists at BrewDog feel better about their decision to open up an awesome new spot in Columbus (too bad we had to miss out on Stone Brewing first, but oh well, we are not bitter). Even in the south, which is home to the country’s most restrictive regulations, lawmakers are starting to come around. But, you know, in that moseying southern way. “I think that Orlando is [being] very, very progressive in this,” said John Cheek, president of Orlando Brewing. As an Orlando craft brewing pioneer, Cheek has run up against the city’s zoning rules in the past. His microbrewery is in an industrial district. So its tasting room, where customers can sample and buy Orlando Brewing’s beer and merchandise, was not allowed to take up more than 25 percent of its overall floor space. Years ago, his plans for an outdoor beer garden were rebuffed by the 25-percent rule, Cheek said. The new rules would allow up to a 50/50 split between manufacturing and retail. City planners hope the added flexibility will help lure new breweries and allow existing ones to expand. The city also would for the first time allow brewpubs — restaurants that brew their own beer on site — to set up shop in industrial districts. Alabama brewers, starting this month, can now sell growlers, a move estimated to create more than 650 new jobs and more than $100 million in revenue within five years. We can’t verify those estimates, but we did happen to chat with an operations manager from Back Forty Beer Co. randomly at the CBC in Philadelphia (probably the sweetest person we had collectively ever met) and she was beyond thrilled about the growler rule change. She couldn’t emphasize enough how big this would be for them. And again, the change was simply to allow growler fills! If the Oklahoma craft brewing industry expanded by only 10 percent, economic activity would be between $9.42 million and $11.58 million higher per year. This would amount to a total impact of over $425 million. Assuming a more aggressive growth path, the craft brewing industry could attribute between $51.42 million and $53.58 million more in economic activity per year. This would amount to over $465 million of economic activity. In 2014, the OKCB industry had a $415.7 million economic impact. Put another way, each 12-ounce pour of beer produced in Oklahoma generated $65.94 worth of economic activity. In taxes alone, the Oklahoma craft brewing industry was responsible for approximately $5.6 million in direct tax revenues. Given the existing laws that restrict craft beer production and consumption, there is a large amount of growth potential that could result in a substantial economic benefit to the state. If some or all of these laws were relaxed, an additional $10.5 million in economic activity could be realized assuming that the OKCB industry grew by only 10 percent. Assuming a more aggressive, yet feasible, growth path of 50 percent, economic activity will increase by approximately $52.5 million. In a state that prides itself in supporting entrepreneurship, it is natural for the burgeoning craft brewing industry to take hold. If restrictive state alcohol policies are amended, the OKCB industry can have a significant impact across the state. Look, I get it, you like regulations. Here’s the thing: I like regulations too! They are usually important for stuff like protecting consumers and curtailing competition-crippling monopolies. 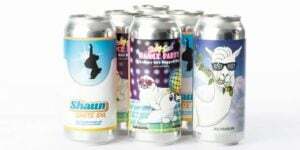 Sure, the free market sounds like a perfectly great idea until, I don’t know, a Beer Voltron forms on the horizon. Suddenly the market is less free than ever. Ironic, huh? But we’re not talking about that stuff here. We’re talking about these seemingly arbitrary and outdated regulations that say, “hey, successful local business, you are about to hit an arbitrary cap, so we must now request that you either stop growing and being successful or drastically alter your operations in order to keep growing.” These seem less useful, especially considering the well documented examples of thriving, booming businesses in the states that are letting their craft beer scenes flourish.